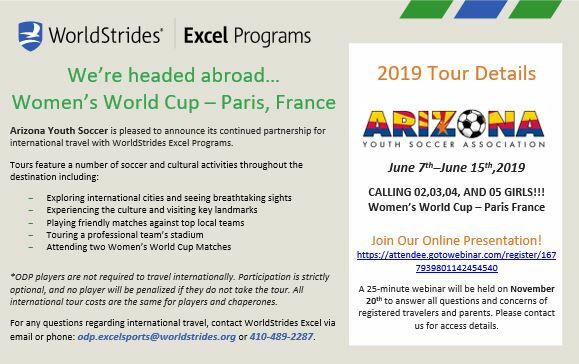 Arizona Soccer Association ODP is pleased to announce its 4th year of partnership with WorldStrides Excel to send our ODP teams to Europe for a once-in-a-lifetime international experience. Arizona Soccer Association ODP aims to provide high-level training to benefit and enhance the development of players at all levels. ASA offers ODP teams the chance to travel internationally and play soccer. Through travel to Europe, players engage in a level of competition not found in the U.S. as well as learn a different style of play. All tours will include training sessions, match play against top academy teams, stadium tours, and attendance at professional matches. Players also mingle with their opponents at pre-game and post-game socials, try new foods, see new sights and bond with their teammates. All tours will take place from March 9th – 17th. Don’t let this opportunity to broaden your player’s horizon slip by! Click the itineraries below for a breakdown of the upcoming tours. For any questions regarding international travel, contact WorldStrides Excel via email or phone at nick@worldstrides.org or 415-694-1897. 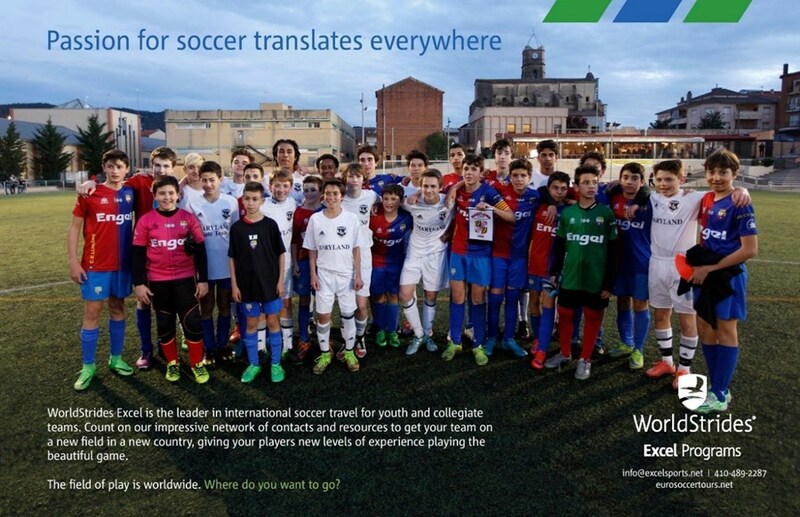 Teaming up with WorldStrides Excel, Arizona Boys and Girls ODP teams spent their 2016 Spring Break in Barcelona, Spain for top quality soccer matchups and an enriching cultural experience! The teams played matches against Sant Celoni, EF Viladecavalls, CE Llinars, Penya Lloret, and UE Centelles. They also enjoyed a stadium tour of Camp Nou - home of the world famous FC Barcelona - took in the local culture with guided walking tours, visited the unfinished Sagrada Familia, Gaudi’s amazing unfinished temple, the gothic cathedral, Picasso museum, the historic gothic quarter and much more! If you want to experience a trip just like this travel with WorldStrides Excel in 2017! CLICK HERE for more highlights from Spain! Excel International Sports has been leading soccer teams from the United States on International trips since 1998. Because of our experience, our knowledge and our network, we are one of the top companies in our industry. Excel International Sports' mission is to bring people from North America to different countries to participate in the world's greatest game while breaking down barriers of language, culture and geography. As world travelers, we make it our our goal to enhance your cultural and sports awareness. Excel International Sports has been taking ODP teams to Europe for over 15 years; we know how to customize a trip to suit the needs of ODP teams. Recent teams that have traveled with our company include the University of Maryland, University of Virginia, William & Mary College, George Washington University, Loyola College, University of Maryland Baltimore County, Salisbury University, Gettysburg College, Lynchburg College, Frostburg State University, Good Counsel High School, Loyola High School, Eastern Pennsylvania Youth Soccer ODP, Maryland Youth Soccer ODP and many others. More information about our tours can be found at: eurosoccertours.net . For more updates, "Like" us on Facebook "Excel International Sports" or follow us on Twitter at "ExcelIntlSports".